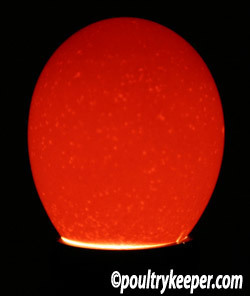 Candling eggs is a straight-forward process but it helps to have some pictures to know what you’re looking for! 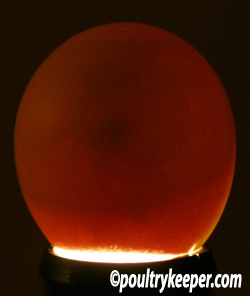 It is necessary to candle eggs for fertility when you are incubating eggs artificially using an incubator. Infertile or bad eggs can be discarded so that there is no risk of them going bad and exploding inside the incubator, contaminating the other eggs. If you are using a separate incubator or hatcher for the last few days of incubation to hatch your eggs, the extra space can be used for more eggs, provided the incubator is kept sterile. 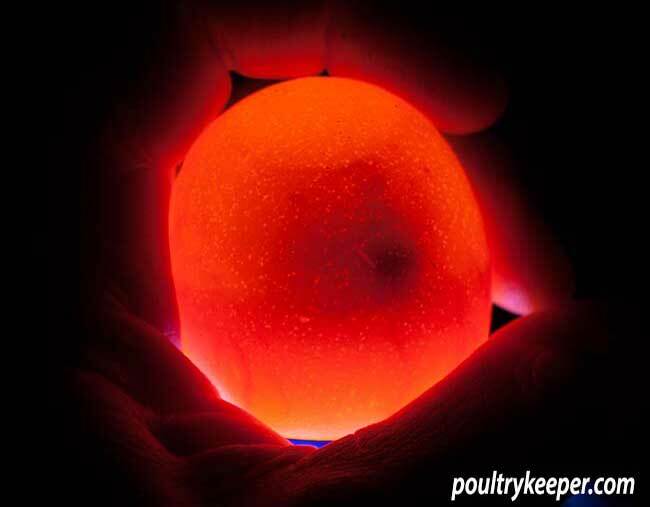 Candling does not damage the embryos inside the eggs as long as you don’t heat the egg up too much with the heat from the candling device or keep the eggs out of the incubator for too long, so it is ideal to get a glimpse at what is going on inside your eggs. Candling gets its name from days gone by when people used to use candles as the light source. Of course these days, you can buy or make your own candler using a light bulb or bright torch as the light source. The cheapest way to create a DIY candler is to place a light bulb (low energy light bulbs are best as you can get a very bright bulb that doesn’t generate as much heat as a conventional bulb) and light fixture or desk lamp inside a cardboard box. Cut a small, round hole in the top of the box, just big enough to sit the pointed end of your egg into. Place your egg onto this hole and turn the light on. You should be able to see what is inside the egg and with practice you will be able to identify fertile eggs by the spider-like blood veins spreading out much like a spider’s legs. Bad eggs (sometimes called dead germs) can also be identified during the candling process. This is where the embryo starts to develop but later died and infertile eggs that are clear except for the shadow of the yolk. Modern high power LED torches that do not give off much heat are also an excellent light source that can also be used for candling eggs. The following photo was taken with me holding my hand around the end of the torch underneath the egg. This is day 8 and the embryo can be clearly seen. 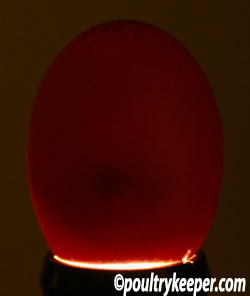 Dark shelled eggs (Such as Marans or Welsummer Eggs) are much harder to see through so you will need the brightest light source you can get, and will need to candle the eggs in a dark room to stand a chance of seeing development. If you still can’t tell, you will have to wait longer until the embryo has developed further and can be seen more easily. 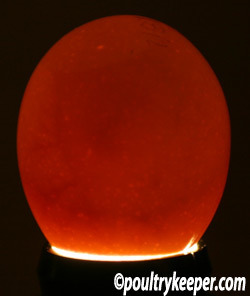 Eggs are normally candled after 7 to 8 days of incubation. The most critical period of incubation during the development of the embryo is the first week so it is best to be patient and only take a look after the first week. You will see more after a week and can be more certain about the fertility as well. It’s not easy to see development in the first few days, especially to the untrained eye. 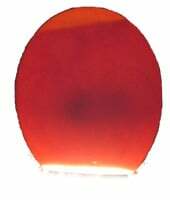 Here are some photos of candling eggs I have taken, (8 days into incubation) which will help you to know what to look for. Candling can be done earlier than this but remember the embryo is very fragile during the first few days and it is easier to see positive signs after a week when the embryo appears as a dark patch with spider like veins around it. If you are unsure whether the dark patch is inside the egg or part of the shell then you can rock the egg back and forth gently and you should see the embryo moving inside. The Yolk can’t be seen as it is the opposite side but can sometimes be seen as a dark cloud towards the center of the egg. Candling a Fertile Egg. Day 8. Candling a Fertile Egg. Day 8. You can’t always see the embryo. Here it is towards the center / back of the egg but blood vessels can still be seen. So what’s happening inside the egg? The image below should give you an idea of what is going on inside the egg by day 8. The embryo has grown significantly and the eye is usually visible (the darkest ‘blob’ you see in the egg). There are digits on the feet, the heart is completely enclosed in the thoracic cavity, and the embryo is starting to look more like a chick. Feathers start to grow from day 8. There is a sack attached to the embryo that is called the allantois (shown in blue). This goes around the back and head of the embryo and holds the waste. This is the yukky bit you’ll find left in the shell when the chick hatches. The yolk sack is now very red and full of blood vessels that go out into the alubumen (egg white). The air sack at the broad end of the egg has increased slightly in size. Eventually, the chick will fill almost all of the space inside the egg and the air sac will increase further in size (see the diagrams below). 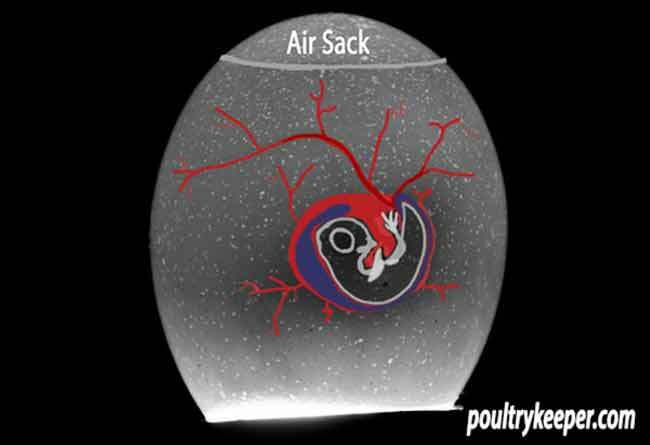 When the chick finally hatches, it will break through the inner membrane into the air sac to take its first breaths of air. It will crack / push through the shell with its egg tooth (attached to the end of the beak). This allows further oxygen into the air sac so the chick can continue to breathe. Over the final 24 hours, the remainder of the yolk sack will be absorbed, this will give the chick enough energy to turn inside the shell and slowly break from the shell as it goes. It will then use its feet to push itself out of the shell. There is little point in candling eggs during the final few days other than to check for the air sack size because you will not see much. The chick almost fills the shell. If you assist a chick in hatching, you take the risk of removing the shell too soon, before the yolk sack has been absorbed and before the navel has healed over where the allantois was attached. High humidity in the incubator will stop the membrane from drying out, keeping it soft and easy for the chick to break out. Chicks do not need food for the first 24-48 hours after hatching thanks to the energy they get from the yolk sack (this is why commercially they can sell and ship chicks as ‘day olds’ around the country). 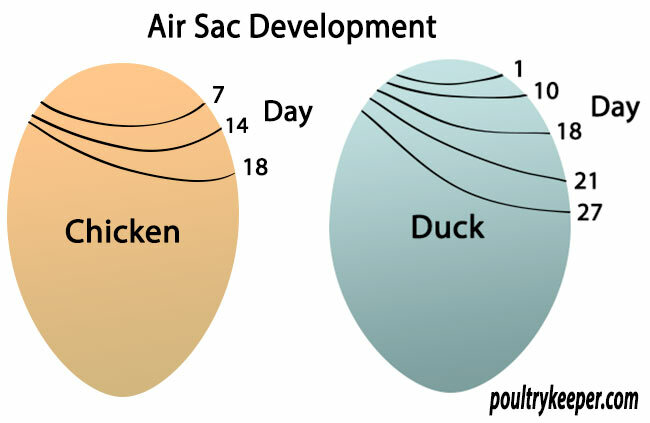 The images below show you the relative air sac sizes at different stages of incubation for chicken and duck eggs. Compare these to your eggs during candling. Mark your eggs with a soft pencil so you can monitor progress. If the air sack is too small, the incubation humidity is too high. If the air sack is too big, your incubator humidity is too low. Are you concerned about the humidity or settings of your incubator? My article on Setting up your incubator for a successful hatch may help.